Yesterday morning I attended the Amazon press event where they unveiled their newest Kindle reader. Jeff Bezos, founder and CEO of Amazon, demonstrated the device and he talked about how people use the Kindle. He said that people can use it while on the treadmill and I tried unsuccessfully to think of a scenrio where that would not end badly. I don't know about anyone else but when I'm on the treadmill there is very little opportunity to focus on reading. Besides that, I'm guessing that the percussive force from running would likely vibrate a device right off the holder. Every time I run indoors the clock across the room turns, moves or falls off the bedside table. The writer, Stephen King, followed Bezos on stage and he also talked about reading with the Kindle on the treadmill. Maybe it works for walkers. 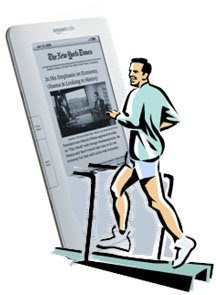 I'm going to try an experiment this weekend to try to read the NY Times or Fortune magazine on my Kindle while I run. If it works I'll gladly retract my skepticism. Let me know how this goes - I'd love to be able to read and run simultaneously, but for the life of me (like you), I can't imagine doing so without injury, or at the very least, motion sickness! I get dizzy if I try to read, even at a walk. I know people who type on their laptops while walking. I don't know how they do it. It's possible that I'm just very uncoordinated. There are some things that just don't go together (like texting and driving). 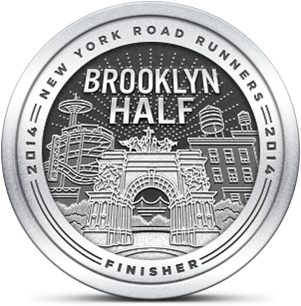 Running and reading may be one of those things. It seems like if you can do both you're not doing either well. And yes, motion sickness is likely. Walking may be a different story. Here's an amusing article in TIME about using a treadmill desk: http://www.time.com/time/magazine/article/0,9171,1862448,00.html. I can't imaging walking with a laptop. Coordination is probably the least of the problem! Doesn't the new Kindle read out loud to you? Maybe that's how they mean you can use it on treadmill. I'm not sure you could hear the Kindle over the noise of the treadmill. That's certainly true with mine.